Hail damage can be hard to spot, especially if you’ve never looked for it before! When people think of hail storms, most think of potential vehicle damage and repair. But when hail hits, it will damage the roof of your home, and possibly other personal property. While almost all hailstorms are destructive, the amount of damage can vary greatly. This page will help you understand how to identify hail damage and the appropriate steps. There are many other types of damage that can be mistaken for hail damage. For example, exposure to harsh weather and sun makes shingles brittle and makes them look older than they are. Damage like this is normal wear and tear of shingles, and is not covered by insurance. Types of normal wear and tear may include granule loss, flaking and algae (which looks like dirt!). 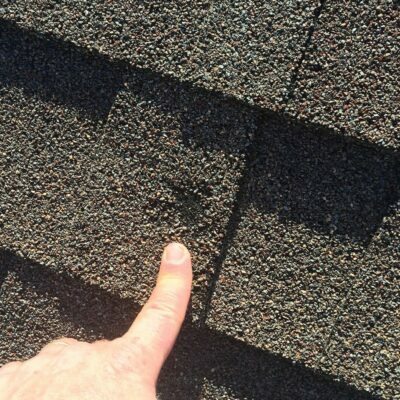 Manufacturing defects in shingles can also be mistaken for hail damage. Shingles react differently when struck by hail. It is helpful to know the different effects of the damage so you can tell whether or not you have roof damage from hail. What seems like random damage with no pattern. Loss of granules, which sometimes expose the roof felt. Look for hail impacts – called “splatter marks” – on your driveway that are lighter than surrounding areas on driveways or sidewalks. Hail hits that are soft to the touch. You will be able to feel when the shingle as broken, as the backing will become soft. 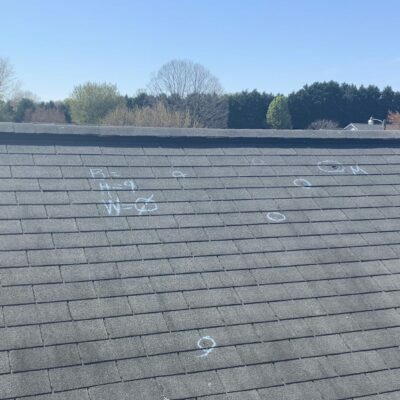 If you think you have hail damage from a recent storm, or would like to double check to make sure, give us a call for a free roof inspection!